A stamp on a diploma won’t bring you the money, freedom, and fulfillment you want in your career. The right skills and knowledge will. feeling far less overwhelmed, and having a lot more fun. If you want to live up to your potential, you can't afford to miss this..."
"I immediately used [this] advice to bring in an extra $120,000 this year. These simple principles are astoundingly effective." If where you are right now in your career isn't where you ultimately want to be, then you probably know you need to do something in order to get to that next level. You're definitely right about that. It's a simple fact that without expanding your knowledge base, upgrading your skills, and improving your performance, you won't get any further than you've gotten so far. But exactly which skills and what knowledge do you need, and what's the best way for you to get them? MBA programs and so-called business training experts have made a fortune convincing people that the answer to that question is complicated, time-intensive, and very expensive. But the truth is, achieving big success in business doesn't have to involve any of those things. My name is Josh Kaufman, and I've spent nearly a decade systematically isolating the universal principles of modern business practice — how to understand how any business works, and how to immediately identify the critical elements that will help you make it better. After investing all that time (and thousands of my own dollars) on this research, I've discovered the single best thing you can do to permanently increase your productivity and effectiveness as a businessperson… so that you can achieve greater success and make more money now and for the rest of your life. It doesn't take a lot of time. It takes an amazingly small amount of money. A brand-new business venture collected $500,000 in revenue the first 14 months, operating on zero debt with sustained profit margins 4-5x comparable businesses in the same market. One of my students went from zero business knowledge to being the CEO of a profitable company in less than four weeks. Another student increased his consulting fee for his top client by $120,000 a year, and the client happily paid. Another student increased his profitability 8x after changing his target market and streamlining his offers. And that's just for starters. I've helped millions of people around the world — corporate leaders, entrepreneurs, and smart, ambitious people like you — learn essential business concepts on their own terms, and substantially improve their careers, businesses, incomes, and overall quality of life. 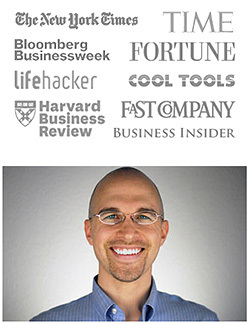 Josh Kaufman's unique multidisciplinary approach to business mastery has helped launch and improve the successful careers of thousands of entrepreneurs — and directly saved prospective business students millions of dollars in unnecessary tuition, fees, and interest — by providing an effective, affordable, and debt-free method of learning fundamental business principles. Josh's work has been featured in numerous publications including The New York Times, The Wall Street Journal, Fortune, Time, Wired, Fast Company, and HarvardBusiness.org. His brain is insured by Lloyd's of London. At the time, I had a position with a well-known company. The job was decent, but it wasn't my final destination. I knew I wanted more and that I had to fill in my knowledge gaps if I was going to get it. It seemed like an MBA could be the fastest and best way to get where I wanted to be in my career. Maybe the only way. So I started considering the possibility. On the one hand were all the benefits I assumed would come with that degree: money, status, opportunity, connections. On the other hand was the cost, the time involved, and, most importantly, the overwhelming amount of money I'd have to spend. Money it would take me years and years to repay. I spent a lot of time weighing the pros and cons. Then I made my decision. And as a direct result, I learned everything I needed to know about how to run a highly successful business. Thanks to all the knowledge I gained, I DID get the bigger paycheck, the nicer house, and the better life. Better, in fact, than I'd ever thought possible. What I didn't get was an MBA. Not just “as good as” an MBA. It would change everything, right? It would increase your confidence, your value, and your potential a hundredfold. Any employer would immediately identify you as a huge asset. And you'd be in an incredible position to become your own boss too, if that's what you wanted. You'd be more or less unstoppable. Yet, as I discovered, these are exactly the kind of practical, useful skills that AREN'T necessarily taught in business school. Plus, $150,000 was the low end of what a degree would cost me. Even an interview for my dream job didn't seem worth that gamble. He suggested I skip B-school, stay put, and educate myself about business on the job. In his opinion, all the theory and hypotheticals you got in school were no match for what you learned in a real, live organization. What he said made sense to me. And I sure liked the idea of getting further in my career without the cost of more formal education. But would it get me where I wanted to go fast enough? Wanting to hedge my bet and hopefully accelerate my success, I took his advice a step further. I decided to widen my "classroom" to include not just people from within my own organization, but the most successful businesspeople of all time. People who'd already done the work, made the mistakes, identified the principles, proven the strategies, won in the end, and recorded their experiences for the rest of us to learn from. I read thousands (yes, thousands) of business books. Interviewed hundreds of seasoned business leaders. Processed their principles. Road-tested their tactics and strategies in the incomparable lab of my real-world corporate day job. Kept what worked, tossed what didn't, tested and cross-referenced continually, and categorized and cataloged everything along the way. In effect, I created my own personal MBA program. Within just a few years of starting my "personal MBA", I had started several small businesses… worked as a manager in one of the largest corporations in the world… created new products in several markets and industries… consulted with clients ranging from one-person startups to multimillion-dollar companies… put together multi-million-dollar product launches… and published a book that became an international bestseller. Not bad for a guy with nothing but a BA under his academic belt. This work started as a personal project. But once word got out about what I was up to, it exploded. Entrepreneurs, creative professionals, and businesspeople from around the world began clamoring to know what I had learned — the simple, practical concepts behind how every business really works. I realized that I was in a unique position to help people learn these essential skills. So I decided to devote my life to teaching them. Then, a few years ago, I decided to take myself — and anyone who wanted to come with me — to a whole NEW level. At the urging of many of my clients and students, I decided to develop a unique LIVE workshop to teach people the essentials of modern business practice in the fastest, most efficient and effective way possible. My intention with this workshop is always the same: to give my participants practical, real-world business skills they can learn quickly, implement immediately, and use to succeed in any venture… in order to permanently increase their wealth and happiness. In other words, I want The Personal MBA Masterclass to change people's lives. If it doesn't do that, then the failure is mine. That's why I make all of my participants a simple deal: If they don't get at least 10 times as much real-world value as the cost of the class, I'll gladly give them a full refund. The cost of the workshop is $2,500. Which means I'm guaranteeing them a tangible $250,000 return on their investment, or their money back. In all the Masterclasses I've conducted, no one has ever taken me up on my offer. But not long ago, I agreed to allow Nightingale-Conant to come and record one of my Masterclasses — the entire three-day event. I loved the idea of this material being transformed into a home study course that people could progress through at their own pace… and have the ability to access and refer to again and again. And so The Personal MBA Masterclass HOME STUDY COURSE was born. In these 16 audio sessions, recorded LIVE at my exclusive Personal MBA Masterclass, you'll learn all of the fundamental principles and proven tactics you need to know (and none you don't need to know) about how to really succeed in business. Sales: How to convince customers to pull out their wallet and buy. The Human Mind: How people collect and process information and make decisions. How to Work with Yourself: How to enhance your own daily productivity. How to Work with Other People: How to productively influence the people around you. Analyzing Systems: How to figure out how any system works. Improving Systems: How to improve a system without blowing things up. Yes, I want to quickly and easily gain the skills and knowledge that will bring me more money, more opportunity, and more fulfillment in my career. Business schools make a fortune forcing their students to take in a HUGE amount of information related to these subjects. The majority of it is theoretical. The majority of that is useless. To be fluent enough in these topics to navigate and succeed in the real business world, you don't need to know everything there is to know. You just need to master a few simple concepts that provide most of the value in each area. These are the "15-20 key concepts" I mentioned at the start of this letter. I call them business mental models, and I teach them all to you in The Personal MBA Masterclass. The Iron Law of the Market: Why every business is limited by the size and quality of the market it attempts to serve — and how to find large, hungry markets. The 12 Forms of Value: Products and services are only two of the 12 ways you can create value for your customers. The Pricing Uncertainty Principle: All prices are malleable. Raising your prices is the best way to dramatically increase profitability — IF you know how to support the price you're asking. Risk Reversal: How to encourage your customers to stop being scared and start being excited about doing business with you. Caveman Syndrome: Why your brain thinks you're living 10,000 years ago, and how you can use that knowledge to stop stressing out and start being more productive. Goals, States of Being, and Habits: What they are, why they're important, and why you can't afford to confuse them if you're trying to get what you really want. Counterfactual Simulation: The most powerful capability of your mind, and how to wield it consciously to reach your goals faster than you believed possible. Resilience: How to be ready for anything the world throws at you, even in the face of ever-present change and uncertainty. Standard Operating Procedures: How a few simple checklists, guides, and rules of thumb can make your company more profitable, less stressful, and more fun. The Experimental Mindset: How to construct simple tests that will help you discover new opportunities, amplify your effectiveness, and make more money. "I just wanted to thank you for sharing such valuable information in the Masterclass. I came back with a fresh perspective on business and a renewed desire to pursue writing. A few days after I got back I told my boss of my plans, and I'm leaving my job in June. Now I'm working on finishing some projects that had stalled and getting other clients and projects lined up. I am so excited about the creative possibilities that are opening up." PMP, Branch Manager at DevFacto Technologies Inc.
"I found the informal group conversations and analysis of new and existing business ideas to be most valuable. The counterfactuals that you presented forced me to think hard and outside the box... The workshop also helped me understand how to apply the concepts that were being taught to real-life situations." The critical concepts you'll learn in this program will have an immediate and profound impact on your professional life. And believe it or not, they're concepts that even the best business schools in the world simply don't teach. You'll be learning real, practical skills, not useless jargon and MBA-speak. My goal isn't to help you simply look as if you know what you're doing. It's to help you know what to do in any business situation you're likely to face in your life and career. By the time you've completed The Personal MBA Masterclass, you will have gained all of the business knowledge you need to achieve massive success — at a fraction of the cost of a traditional MBA program, both in terms of time and monetary investment. That kind of knowledge and confidence is priceless. But the price YOU'LL pay to get it is nothing short of amazing. … and a 100% money-back guarantee for the CD course! Here's the truth: If you want to succeed in business in any capacity — employee, manager, or owner — you must have a solid, comprehensive understanding of what business principles actually are and how they actually work. My own experiences and those of my students and clients have convinced me that committing to and completing this course is the single best thing you can do to permanently increase your productivity and effectiveness as a businessperson. But it's not my results or anyone else's that matter. What matters are the results YOU get. You know you want more out of your career. This is your chance to GET it. There are two avoidable mistakes people make in their pursuit of professional advancement and business success. The first is sinking time and money into a traditional MBA program because they think it's the best or only way to learn what they need to know in order to get ahead. If you've read this far, I suspect you've been persuaded not to make that one. So what's the second mistake? As I said before, upgrading your business mind by expanding your knowledge and skill set is essential if you want to move forward on the path to real success. 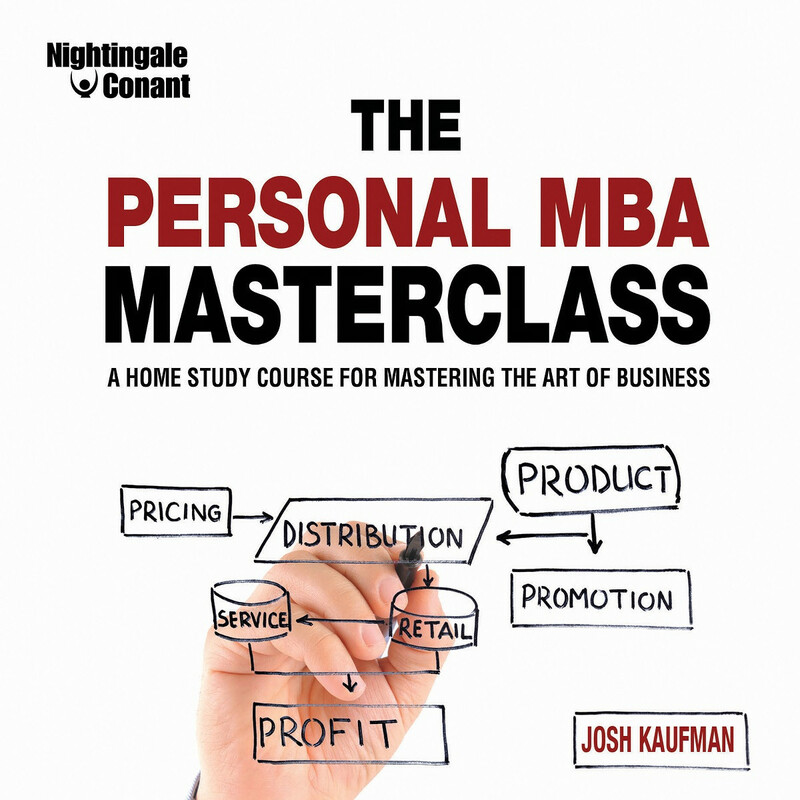 The Personal MBA Masterclass is something that — if you take it seriously and commit to the outcome — can quickly and permanently improve your career, your finances, and your entire life. And you can find out for sure without taking any risk at all. Click on the link below to order The Personal MBA Master Class today. Discover these principles. Internalize them. Then go out into the world and do the great things you've always wanted to do. P.S. A word of warning: The Personal MBA Masterclass isn't for everyone. But if you're serious about mastering business, motivated to apply what you learn, and willing to go out into the world and create massive amounts of value... and increase your wealth and happiness in the process… it IS for YOU. And you'll be amazed by how quickly you start to see real results. Order it today and find out for yourself! Please send me The Personal MBA Masterclass — I can select one of two ways of ordering. GUARANTEE: If I do not find this course to be life changing, I can return it any time within 30 days for a full refund of the purchase price. No questions asked. If I buy the The Miracle of Self-Discipline in the MP3 format and wish to return it, I will simply call Nightingale-Conant to arrange for a refund.